We wear ourselves out trying to be smarter, bigger, the center of attention. But dynamic communicator Louie Giglio's latest book puts success back in perspective. When John the Baptist said that he must decrease while Jesus must increase, he was expressing the secret to astonishing freedom...and incredible rest. This book will teach you the rich, meaningful lifestyle of being small. Free from the worries that used to strangle you, you'll radiate the power of the God who is all the things you "aren't ". "I am not", but God knows my name. "I am not", but He has pursued me in His love. "I am not", but I know the Creator of the universe. 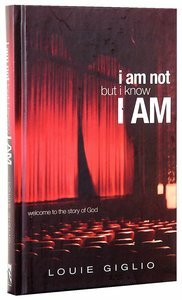 "I am not", but I know "I AM "
If you see life as your own one-act play and history as your story, you could be in for a rude awakening when the curtain finally closes on your tiny tale - and you discover that life wasn't all about you after all. The real story of life is God--"I AM--"the main character and true star of time and eternity." About "I Am Not But I Know I Am"
Life is the tale of two stories—one finite and frail, the other eternal and enduring. The tiny one—the story of us—is as brief as the blink of an eye. Yet somehow our infatuation with our own little story—and our determination to make it as big as we possibly can—blinds us to the massive God Story that surrounds us on every side. I quickly realized I had said the wrong thing, especially to a New York cop. In a heartbeat my hands were on the hood of his car and threats of arrest were flying all over the place. I was startled and unnerved, and though it was now too late, my mouth was shut. Unless asked, I wasn’t saying another word, especially a sarcastic one. a steady, chilling downpour started making things miserable. Assessing the situation, I determined I was too far from the hotel to make turning back a sensible option, so I kept running north along the river, pressing on in the driving rain. I don’t know what kind of shape you’re in, but when I run I think more about survival than scenery. And when I’m running in a cold downpour, I barely think at all. I certainly don’t look around to read a lot of the signs. Thus, I wasn’t paying much attention when suddenly my path was blocked by a chain-link fence. It stretched from the riverbank on my right to a concrete lane divider that had been following me on my left. Once again I considered my options. Retracing my steps still didn’t make sense. What made sense was getting out of the rain. So without thinking I hopped over the lane divider and headed for the shelter of an overpass I now noticed across the way. Quickly the overpass turned into an elevated roadway, so I could keep running under cover. I continued north, not really noticing that the lane to my right at some point became two lanes of traffic, and then three. After another mile or so, all three lanes of traffic were moving slower than I was and a driver in one of the cars shouted something in my direction. But in the rain and traffic, I couldn’t quite make out her words and was trying to ignore her anyway. Then the overpass drifted away to the left and I was once again exposed to the rain. Soon I noticed the lower levels of the United Nations buildings on my far left, and nearer and just ahead two police cars parked on a wide concrete median. A single officer sat in each car, their eyes meeting mine as each step I ran drew us closer. Everything seemed to be fine, until my forward progress was interrupted by the piercing “blurp” of one of the officer’s sirens and the intense motion of his hand directing me to approach his car. that snakes along the eastside shoreline of Manhattan. No wonder the officer’s first question when I finally splashed to a stop in front of his car was incredulous and unprintable. How can you run down the middle of a New York freeway and not know it? I think the same way you can live your entire life completely oblivious to the grand story of the Creator of the universe that is unfolding all around you. The same way you can spend your days making so much of someone as small and transient as you or me, and so little of someone as glorious and eternal as God. That’s why this book is not about you and making your story better, but about waking up to the infinitely bigger God Story happening all around you, and God’s invitation to you to join Him in it. It’s about looking up to see that there’s a story that has been going on long before you arrived on the planet and one that will go on long after you’re gone. God is the central character of this story and of this book. He commands center stage in existence, Creation, time, life, history, redemption, and eternity. this world was made. I’m simply stating the obvious—that THE STORY ALREADY HAS A STAR, AND THE STAR IS NOT YOU OR ME. And here’s why it matters—if we don’t get the two stories straight, everything else in our lives will be out of sync. We’ll spend our days trying to hijack the Story of God, turning it into the story of us. Inverting reality, we’ll live every day as though life is all about you and me. We’ll live as though life is our one-act play and history our story—as though Creation is our habitation alone, existence our playground, and God our servant (that is, if we decide we need Him at all). We will throw every ounce of our energy into the fragmented and fleeting story of us. Calling the shots ourselves, me-centered thinking will dictate every move we make and how we feel. Opting for the short answer, I said, “I’m a pastor.” Two sets of eyebrows rose. For a split second time stood still. And then I told him, “I’m going to remind them that life is short and our time on earth is really brief,” I said. “That’s why we have to make sure our lives count for the stuff that lasts forever.” That’s what I want to do in these pages, too. Lead you to a fresh awareness of the six-lane-wide-freeway-sized God Story that you and I are running down the middle of every day. It’s a place that requires a constant choice. We can choose to cling to starring roles in the little-bitty stories of us, or we can exchange our fleeting moment in the spotlight for a supporting role in the eternally beautiful epic that is the Story of God. Think of it as trading up. Abandoning the former and embracing the latter will allow our little lives to be filled with the wonder of God as we live for His fame and the unending applause of His name. And joining our small stories to His will give us what we all want most in life anyway: the assurance that our brief moments on earth count for something in a story that never ends.